What makes a Sailing Yacht seaworthy? Skipper´s Basics. There´s virtually no review of a sailing yacht nor a blog entry, sailing-related book or documentary which won´t refer in one way or another to this topic: Seaworthiness. Of course, that´s the one main thing of concern when looking at a boat, at the latest from the infamous sinking of the Swedish galleon VASA in 1628. Due to the blatant absence of seaworthiness. I try to dig deeper into that subject by reading a bunch of books and asking pro-skipper Tim Kröger: In this edition it´s the shape of the hull and especially the keel which is of most interest to me. I take the chance to photograph the different types of keels and hulls of sailing yachts in the winter storage where my own yacht did overwinter to inspect the characteristics of each face to face. Do you have sailors like this one in your circle of friends: A close buddy of mine, owner of a 1970ies built Danish Biance once said speaking of his boat that he would never go for anything else than a full keel boat. Her behavior in rough seas, her rigidity and stalwart character would be unrivalled, he argues: “There´s nothing better than a full keel sailing yacht”, he insists. Really? What is that fuzz all about? Sure, a full keel yacht – also referred to as the classic yacht design – produces a full bodied hull, fine lines and bears resemblance to the old school square rigged vessels of the past. Some of the greatest adventures in yachting – such as the Golden Globe Race Around the World with such glamorous characters like Robin Knox-Johnston or Bernard Moitessier – have been accomplished with full keel sailing yachts. Full Keel vs. modern L-Keel. But there are downsides to: “You see, there is no such thing as the most seaworthy or the perfect boat.”, Tim Kröger resumes: “Each type of hull is made for a special use, special circumstances and special abilities of her crew. Comparing a full keel boat of 1970 so a thoroughbred carbon racer with a canting keel of our present times is like looking at a 1914 built triplane and the Eurofighter.” Concerning the full keel boat, it´s her clumsiness – creating a feeling of safety in heavy weather – that incorporates her disadvantages as well. “To be honest: She won´t sail that fast. That´s because her huge wetted surface creates a lot of drag. She won´t go as high up to the wind as modern designs can.”, Tim says and finally: “She is not a boat to win a regatta with.” But ships are a thing for the man´s heart and that´s a question of beauty as well. We all know, beauty lies within the eye of the beholder and I must admit I can see a lot of elegancy in her fine lines. I can very much appreciate my friend´s love to his Bianca as well and his dedication to the easy handling and safe sailing with this kind of ship. Right next to the full keel classic sailing yacht the distinct three white stripes at the waterline do unmistakably mark the sleek hull as an X-Yacht. She is a true beauty, 42 to 44 feet at least. I admire X-Yachts (like almost everybody of us I assume) and here I have the present day concept of a hull/keel-configuration which is incorporated in every yacht since the late eighties or so: The shoal keel or L-keel made for cruising. 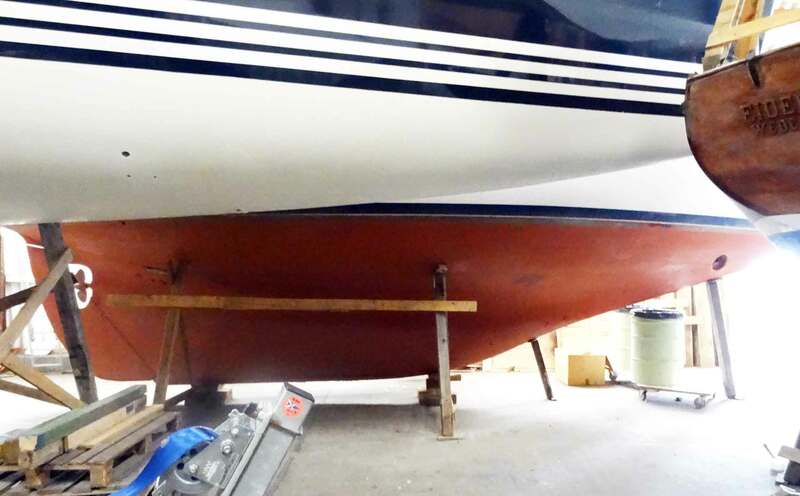 This type of keel-construction mostly features a cast iron-construction bolted to the hull – or to a strengthening grid made of metal or carbon laminated into the hull – with lead concentrated at the lowermost end. These keels do bare – seen from the front – a relatively thick width which is a constructive necessity: Shoal or L-keels have to fulfill two jobs at one time. An X-Yacht with a modern Shoal or L-Keel made for Cruising and easy access to Anchoring Grounds. 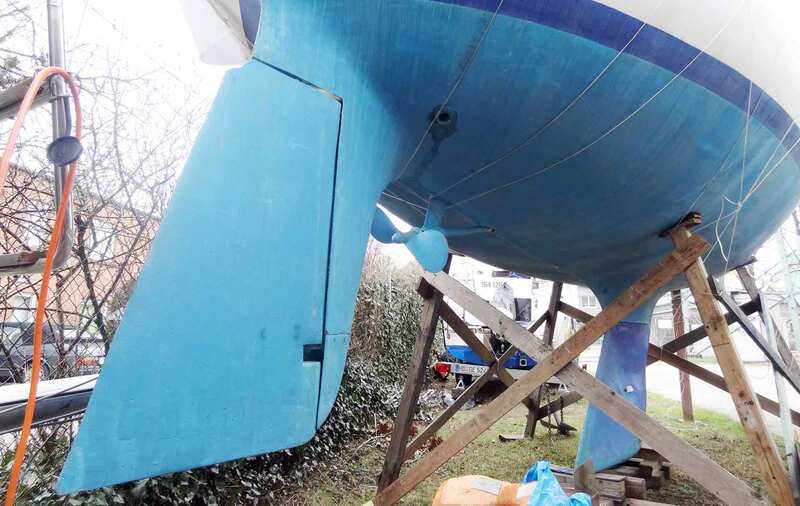 “A keel´s primary function is to form the center of gravity by concentrating a lot of mass as deep down below the hull as possible”, Tim Kröger explains: “On the other hand a cruising sailor wants to enter shallow lonely bays and inlets to drop anchor. Besides, a lot of marinas won´t offer depths with more than 3 meters. So a shallow keel is needed – which makes the construction shorter.” But to have a shorter keel and applying the same weight-ballast ratio at the same time means to put more weight into the keel: That increases the overall weight. An L-keel is, like everything about a boat, a compromise. L-keels are perfect for cruising: Entering shallow waters is possible, the keel´s construction is sturdy and massive so hitting an underwater object or running aground won´t do much harm (hopefully) and stuff like seagrass and weed won´t entangle with the keel due to the L-form. 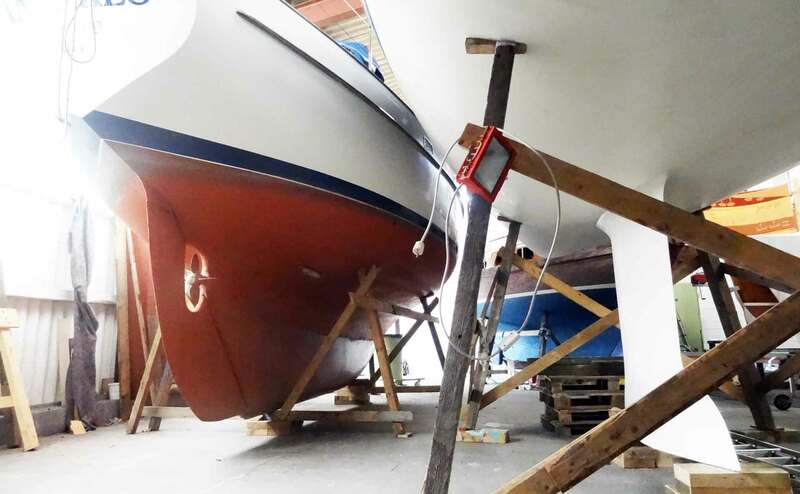 “These boats do have less wetted surface as the full keel boat, so stability and holding a course steadily will be ensured by the keel and a relatively large-area rudder”, Tim Kröger explains. “These boats do behave very vivid, can go higher up to the wind as are fun to sail upwind.” At the same time a shoal keel-boat is also easy to control but demands skills as well: “Modern constructions draw their stability from speed”, Tim says: “When the flat hull won´t have too much influence on stability anymore this has to be substituted by something. This is: Speed. You may take this comparison as example”, says Tim: “A large wing with a lot of surface area of an old double-decker plane creates lift and stability at relatively low speeds. The tiny triangle wings of a modern day jetfighter will create lift and stability only when streamed in fast by the air. So speed creates safety on modern boats.” On the other hand, Tim admits, controlling these boats at low speeds when berthing for example requires skills – such a hull may be blown off course easily. Judging between the old school concept of the full keel boat and the shoal keel modern day cruiser is of no question for me because I do already own a yacht: It´s a 1975 built Fiskars King´s Cruiser 33, a boat constructed by the then common IOR-Rule: Wide and beamy hull with a fin keel and a full skeg rudder. One can see this as the connecting piece in boat construction. The fin keel does incorporate all the advantages of modern day yachts by keeping some of the full keeled-boat´s good-naturedness because the hull does bring a substantial share of displacement below waterline as well. 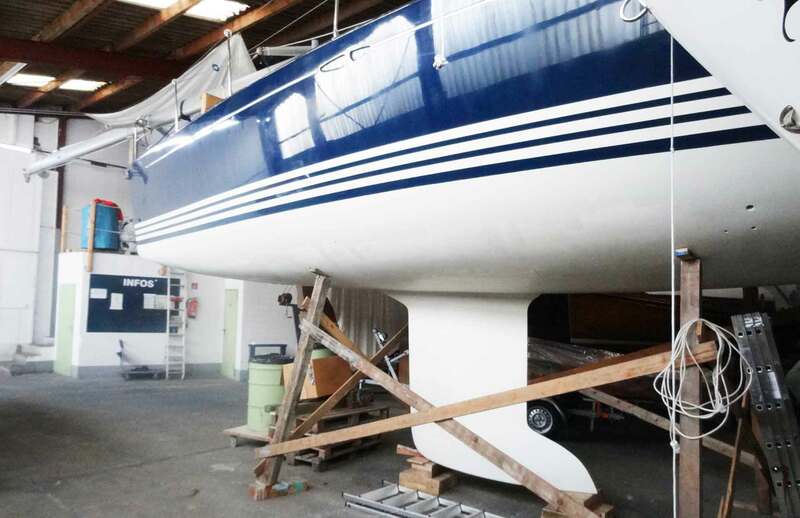 At the same time, wetted surface is reduced substantially making these cruisers – still today – popular among cruiser-sailors and nostalgic regatta-oriented skippers. The IOR-Era with a Fin Keel and Skeg Rudder. The full skeg does function as guard for the rudder itself: The second line of defense if you will. 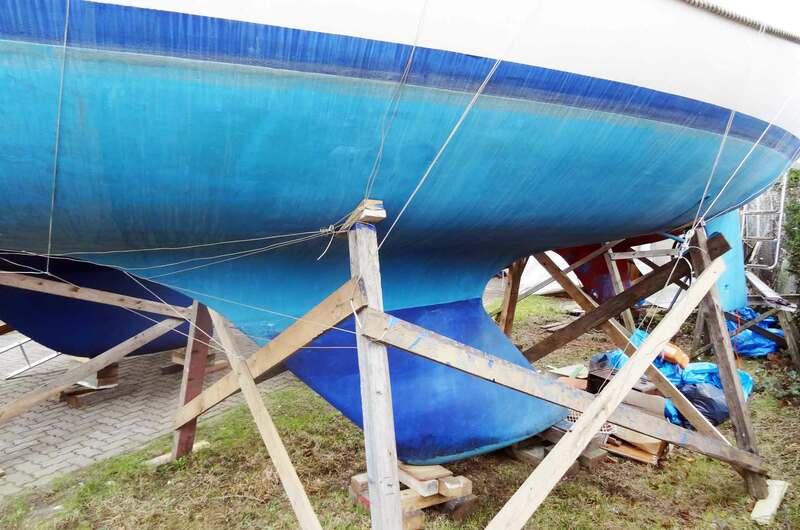 The massive keel is the first, the skeg the second barrier to crush before something can do harm or damage the rudder. I don´t have too much sailing skills and experience by myself but what I´ve experienced so far does support Tim´s claims: When operating the very flat bottomed motor vessel when doing my yachtmaster exam I noticed the boats extradition to wind blowing it off course: No wetted surface under water. When maneuvering my own SY OLIVIA through our marina for craning it was a lot better to hold her on course despite the relatively strong winds during that particular day. The Full Skeg Rudder on my King´s Cruiser 33. IOR-yachts and the so called “GRP-classics” with fin keel and skeg rudders are of course way outdated today, no question about that, but they can – alongside their fellow full-keel-sisters – sustain a certain share in the world´s cruising fleet. But there have been numerous improvements in terms of hull design and keel construction in particular, leaving my Kingscruiser 33 and her IOR-fellows only the part of riding out the tail waves of the much faster modern day boats. Which brings us to the performance end of the row: The T-keel. 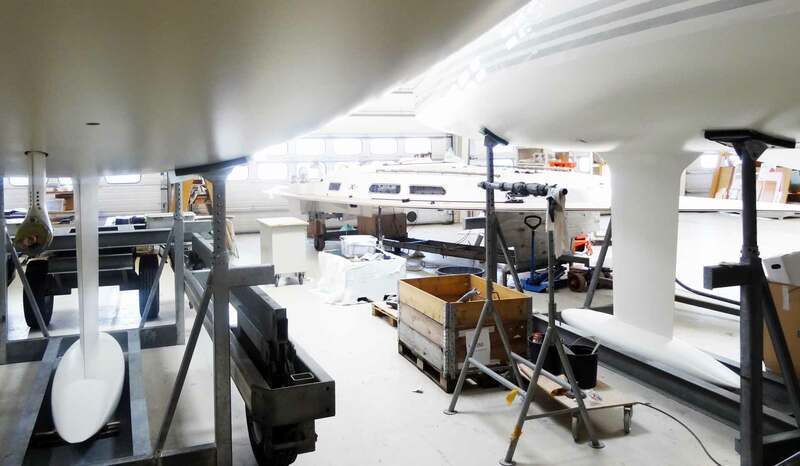 Having had the chance to visit X-Yachts in Haderslev/Denmark last week (you can definitely look forward to this upcoming article!) I took some pics of these keels. Flemming Ancher of X-Yachts, who was investing some 4 hours to show me around and answer all of my questions, also had some interesting facts on these. To have the full performance of a state-of-the-art yacht like the XP44 for example unfold, it is advised to opt for the deep T-Keel. This puts the center of gravity very much down below the hull thus creating a very strong lever arm – by saving weight in the same instance. Because the leverage is bigger the weight of the lead bomb can be further reduced without sacrificing stability. Tim Kröger says: “Of course, these modern performance-oriented boats with a lot of potential do only live up to the expectations when driven accordingly. That means: Speed. But here´s the skipper coming into the game. Most of these do seem to have a kind of fear against bigger sail-area up in the wind. But modern boats need speed.” He argues that in his mind some owners of modern performance-cruisers tend to reduce sail too early because sailing fast requires a lot of skills and attention. “It´s nerve-racking, and it needs dedication and skills. But that´s what these boats are made for.” The T-keel features a long but very thin iron foil with a streamlined bomb at the bottom. 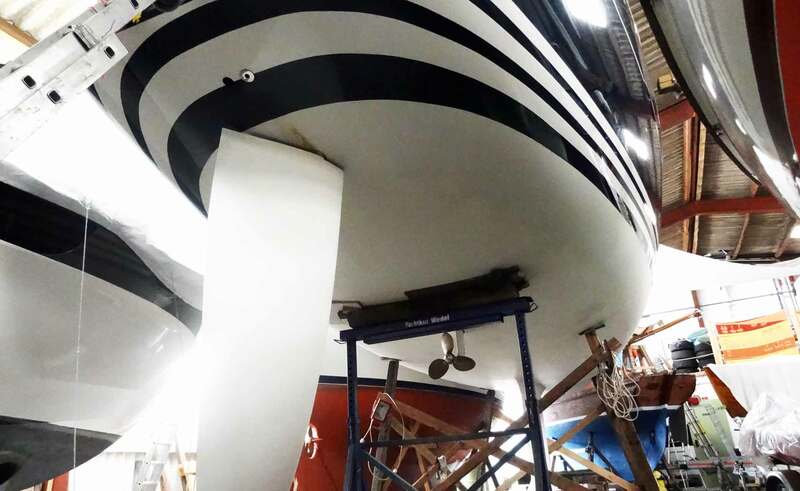 When crafted properly this kind of keel delivers the best leverage power for a maximum righting momentum plus least weight with most performance. 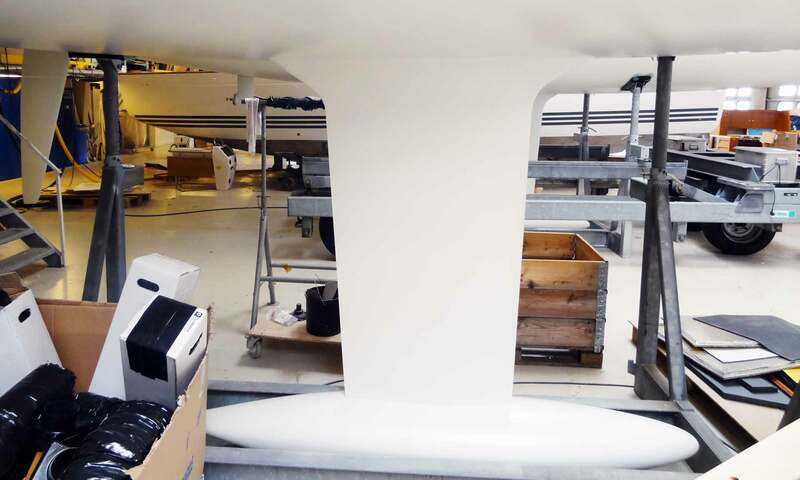 When it comes to seaworthiness, a modern T-keel boat is as safe as the sturdy full keel-yacht: “If the skipper can handle the boat properly and has the skills, from my point of view it is really not a matter of which keel a boat features.”, says Tim Kröger. Of course, when looking at the diagrams showing stability curves for different boats it´s crystal clear: A classic full keel yacht should, in terms of capsize and “good manor” in heavy weather, get the label as most seaworthy. But why then aren´t all the yachts built like Colin Archer´s double enders? I understand that hull-forms and keel-variations is just one factor of deciding which boat would be the safest. I think, it is comparable with sports cars: If you can handle 450 horsepower the Porsche GT without any airbags can be driven as safely as a Volvo Diesel family car. So, is it the skipper who makes the difference? Next Post	Learning how to Sail.